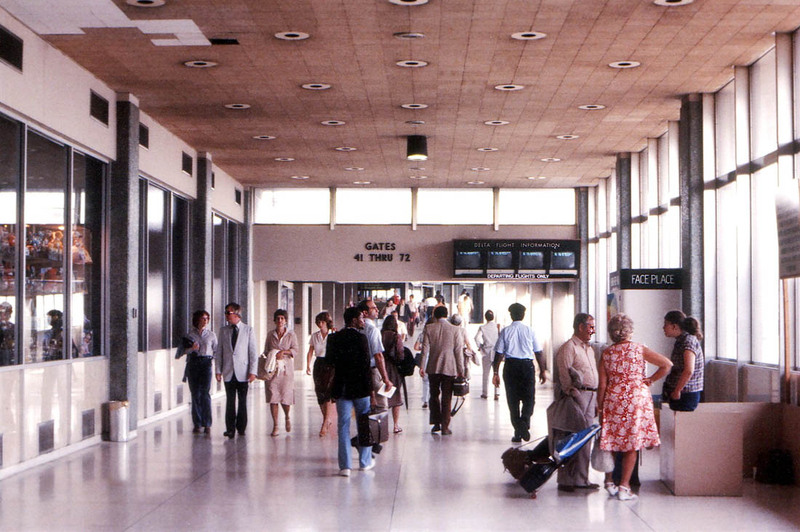 While many ATL travelers, employees and media outlets were focusing their attention on the upcoming grand opening of the midfield terminal in 1980, photographer Bob Van Hemert was focusing his attention and camera on the soon-to-close 1961 facility. 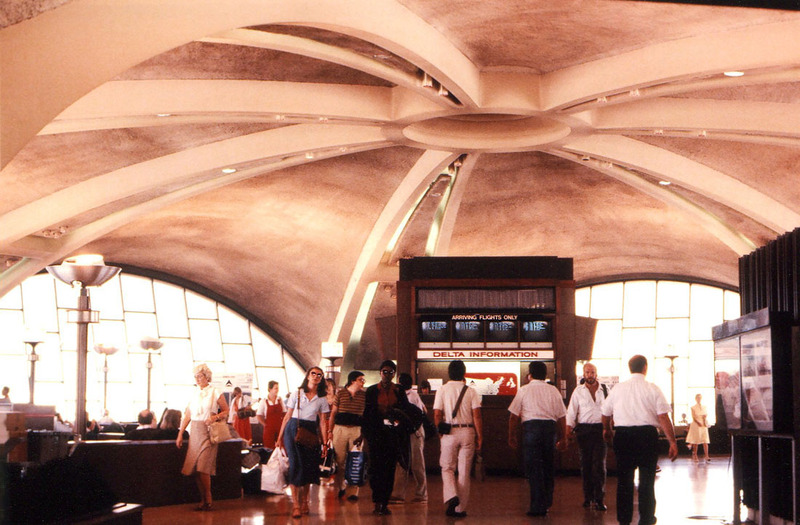 Luckily for us, he captured these wonderful images of the terminal interior. 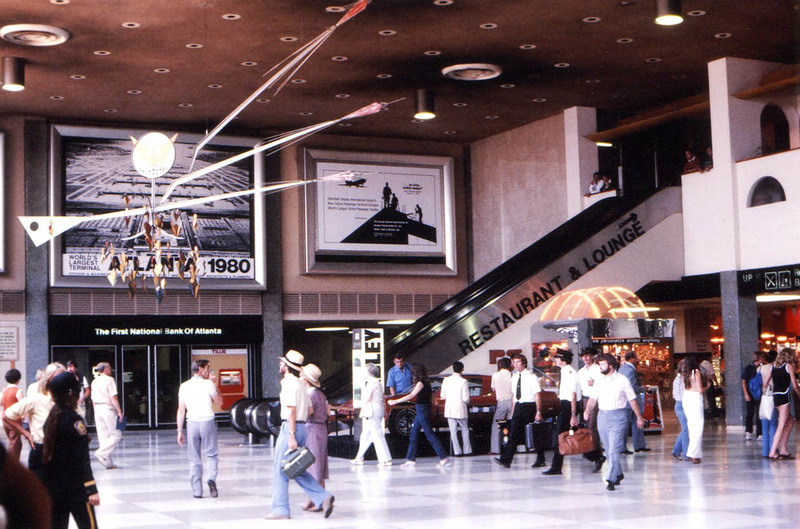 These typical everyday scenes showing ticket counters, lobbies, concourses and rotundas would certainly have seemed mundane in 1980, but with the passage of nearly 4 decades, they're utterly mesmerizing today. The photos are arranged in a roughly linear order, a virtual walking tour starting in the concourse F rotunda and ending in the main ticket lobby. 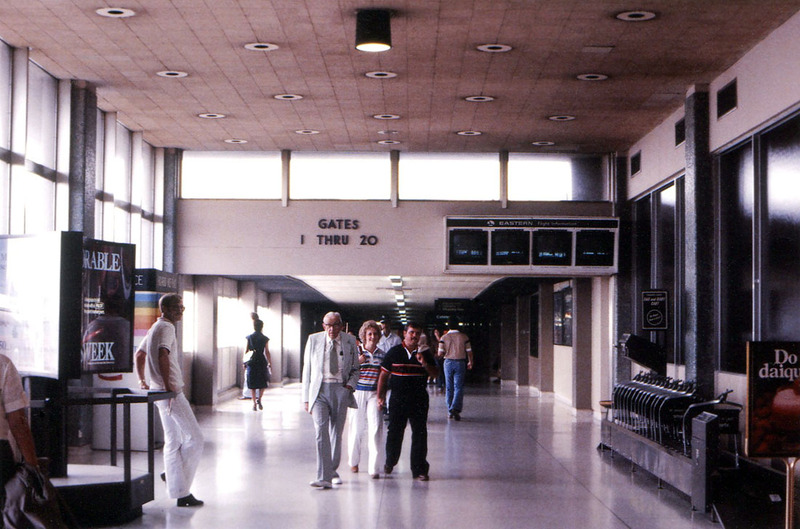 Thanks to Bob for sharing this glimpse into the final months of the Atlanta's "Jet Age" terminal. 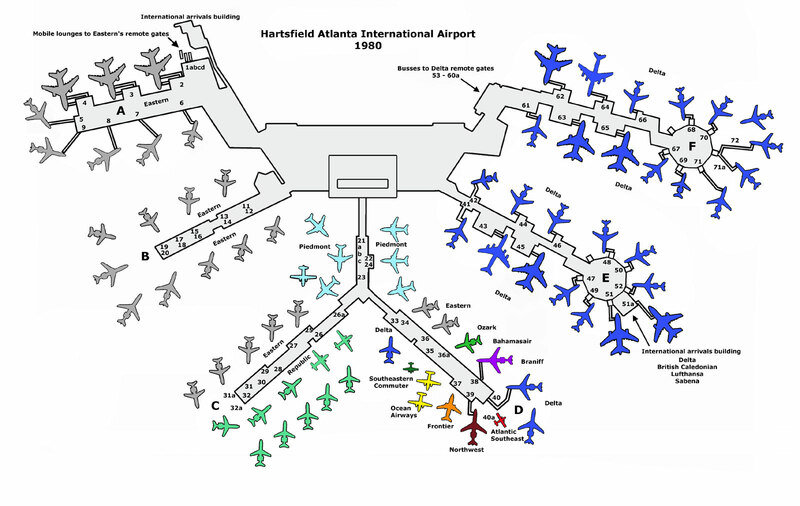 To get your bearings, you may want to look at this diagram of the terminal layout in 1980. 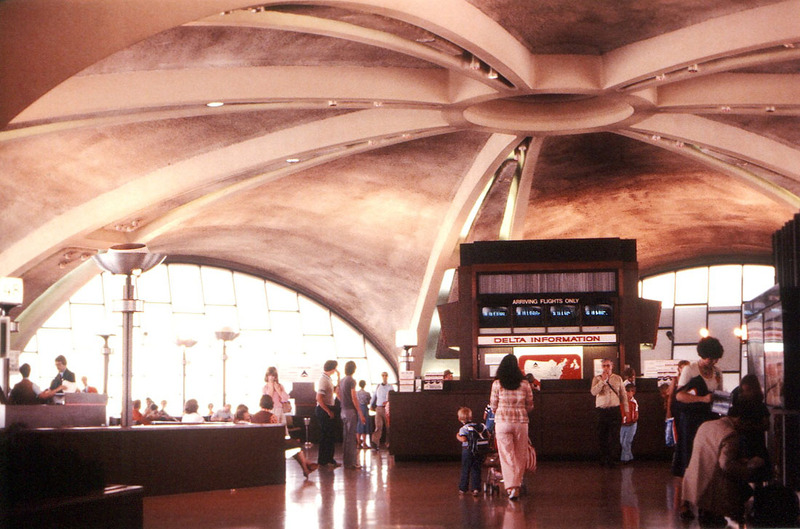 We begin our tour in the impressive futuristic rotunda at the end of concourse F. Delta Air Lines added two rotundas, one at the end of each of their two concourses E and F, in 1968 to nearly double their number of gates. This is the view when entering from the main concourse. Notice the poles throughout the photo with lights aimed at the ceiling. The rotundas were primarily illuminated with indirect lighting, giving the gates a slightly otherworldly ambiance at night. 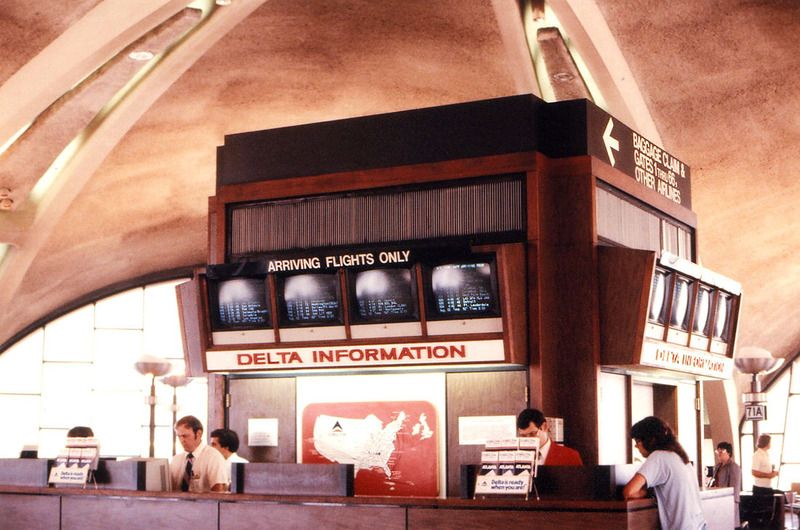 A Delta Air Lines information booth was located at the center of each rotunda. Another view of the concourse F rotunda showing the typical layout of the gates and passenger boarding area. You can see the opening leading to the gate 71 jetway at center right. This is the corridor which connected Delta's concourses E and F. In this view, concourse F would be straight ahead and concourse E would be directly to the right.. Here's another view from roughly the same spot as the previous photo (turning 90 degrees to the right) looking down concourse E. This is where concourse E met the terminal, which accounts for the odd angles on the ceiling. Here's the view inside the concourse E rotunda. 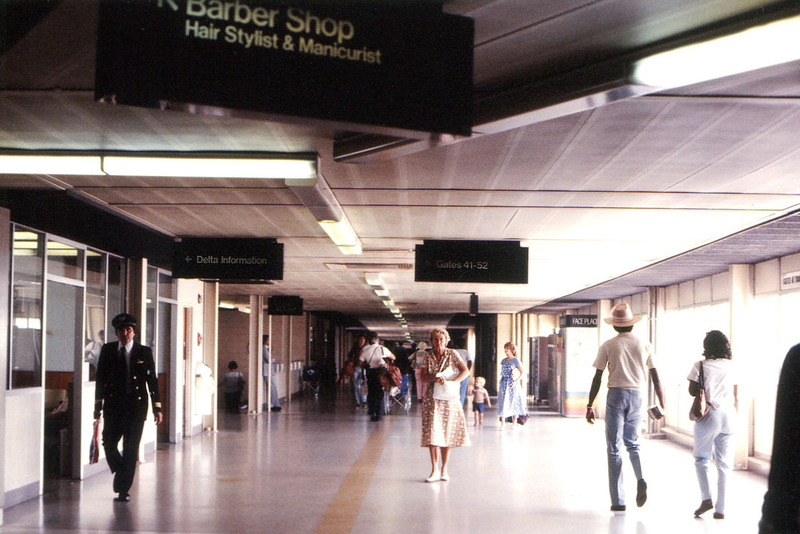 While the rotundas were virtually identical, an international arrivals building had been added to the end of concourse E to handle flights arriving from Europe. It can be seen through the window at the right. A view of the corridor leading from the terminal to Delta's concourse E and F. Standing in this spot, the main terminal would be to your left and concourses C/D would be to your right. Eastern's concourses A and B would be directly behind you (seen in the next photo). This is the opposite view from approximately the same spot as the previous photo. 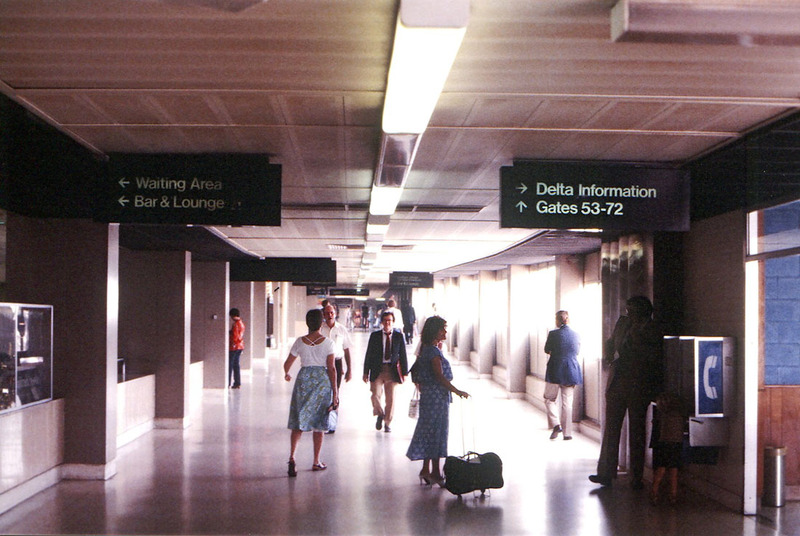 This corridor led to Eastern Air Lines gates on concourses A and B. The main terminal is to the right. This is the central lobby that connected the ticket lobby (out of view, off to the left) to the concourses (to the right). Hanging from ceiling is the famed Julian Harris mobile depicting the phoenix (the mythical bird symbolizing Atlanta's rise from the ashes of the Civil War). Also, notice the giant banner announcing the upcoming opening of Atlanta's "World's Largest Terminal". One thing that stands out in this and many other photos is the blackened ceiling, particularly around the air vents. 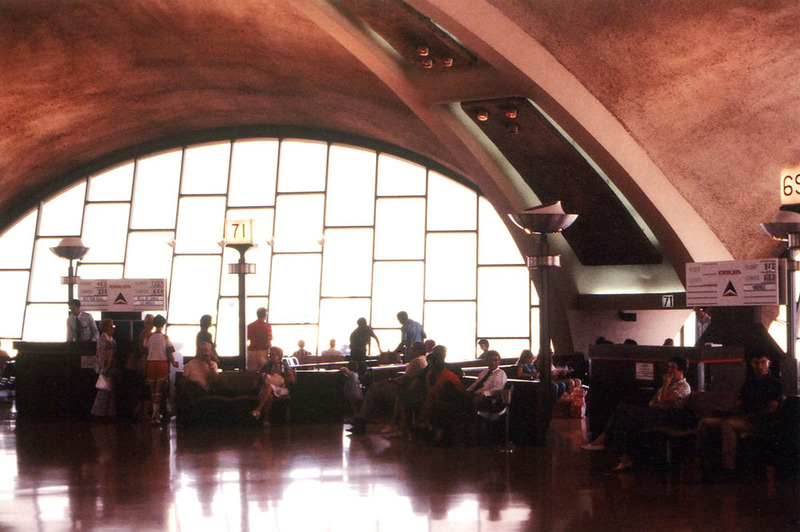 Probably the result of 2 decades of cigarette smoke (smoking was allowed in all areas of the terminal in those days). Another view of the central lobby, taken from the second level seen in the previous photo. 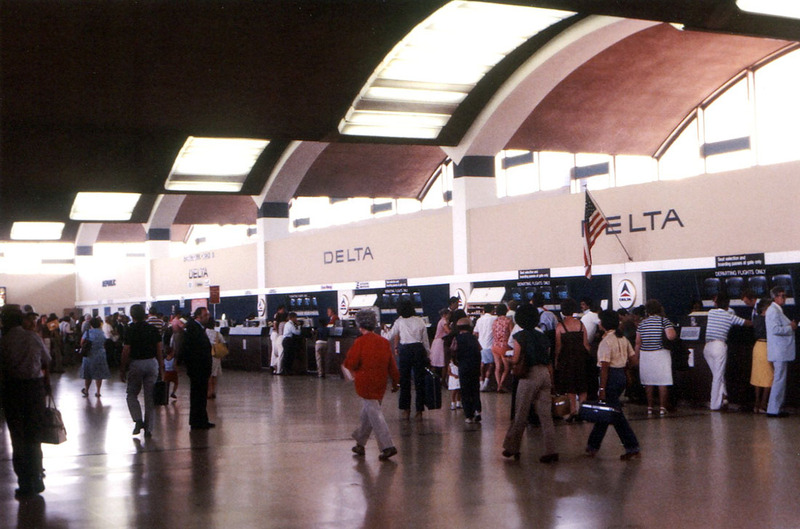 The left side of the main ticket lobby, dominated by Delta Air Lines. The Republic Airlines counter is to the left. 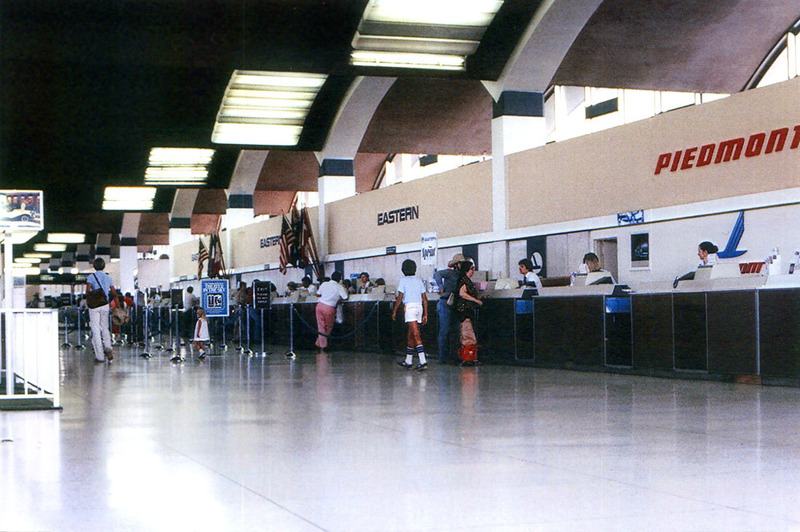 The other end of the lobby was dominated by Eastern Air Lines. Piedmont and Northwest (out of view, off to the right) were also located here. The Delta counters seen in the previous photo are in the distance at far left and the famous turquoise Atlanta control tower is just outside the windows at top right. 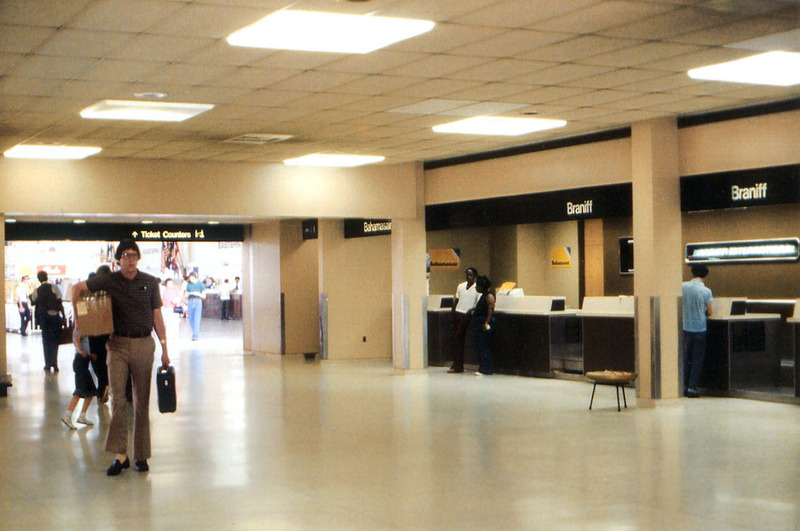 In the late 1970s, crowded conditions led to the construction of additional ticket counters in the area connecting the main lobby and concourse A. Bahamasair and Braniff International were located here. 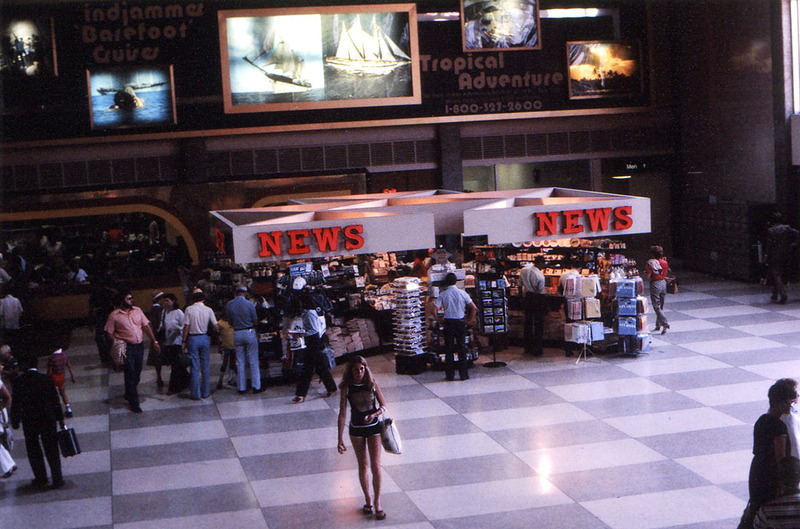 The Eastern Air Lines counters shown in the previous photo can be seen in the background here. Thanks again to Bob Van Hemert for these great photos!